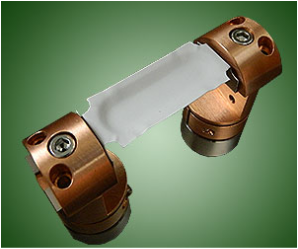 ﻿Thermal Evaporation﻿ is one of the simplest of the Physical Vapor Deposition (PVD) techniques. Basically, material is heated in a vacuum chamber until its surface atoms have sufficient energy to leave the surface. At this point they will traverse the vacuum chamber, at thermal energy (less than 1 eV), and coat a substrate positioned above the evaporating material (average working distances are 200 mm to 1 meter). The pressure in the chamber must be below the point where the mean free path is longer than the distance between evaporation source and the substrate. The mean free path is the average distance an atom or molecule can travel in a vacuum chamber before it collides with another particle thereby disturbing its direction to some degree. This is typically 3.0 x 10-4 Torr or lower. 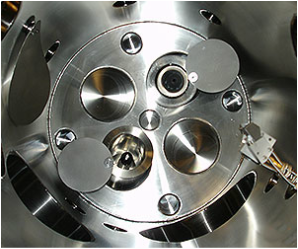 The main reason to run at the high end of the pressure range is to allow an ion beam source to be employed simultaneously for film densification or other property modification. As a result of its simplicity, the cost of equipment ownership is also somewhat lower. 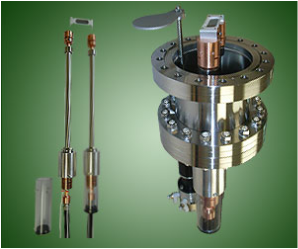 A pair of high current vacuum feedthroughs are employed to flow a significant current (e.g. 300A) through a wide ribbon of refractory metal (e.g. tungsten, molybdenum) that has been pressed to have a large "dimple" on the top side into which pellets of the material are placed. As the current is increased, this thermal "boat" gets hotter and hotter until the pellets of material melt and eventually evaporate. As the evaporation process consumes energy, it is necessary to keep the current flowing to keep the evaporation process going. Increasing the current will increase the rate of evaporation and vice versa. It is also possible to utilize a coil made of a similar refractory metal. Source material is generally shaped into small horseshoe shapes and draped over the coil. As the source material heats and melts it "wets" the surface of the coil and subsequently evaporates in all directions. As a result, it directs its material less efficiently than the "boat" which only evaporates "up". 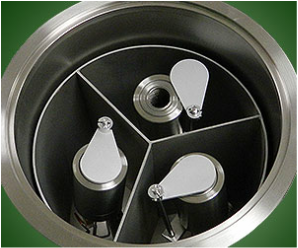 Knudsen cells, Radak furnaces and other custom made thermal sources generally utilize a containment crucible which is surrounded or exposed to a controllable heat source such as a tungsten or tantalum resistance wire (coiled around the crucible), a resistive element or puck or even a quartz lamp. The crucible is heated in a controlled fashion utilizing a thermocouple sensor and a closed PID heater controller. The source material is thereby heated, melted and evaporates from the open end of the crucible and rate is increased or decreased with power input (~heating element temperature). Crucible material chosen is based on its compatibility with the desired temperature, the material being evaporated and cost. Some designs incorporate a "cold lip" feature to keep evaporant from wetting and "creeping" up the inside wall of the crucible and spilling over to short out the heating element.